Our spotlight is back, and this time it's beautiful Lassie! She was attacked by three wild boar and had multiple critical injuries as the boars tusks had gone through her chest and abdomen. Her prognosis was sadly very poor, however, the team performed three major surgeries - a thorocatomy to stitch up the wounds, a leg amputation, and an intestinal surgery. Then Lassie was put on a month of crate rest to ensure she healed properly, and she came out the other end a happy, beautiful three legged dog! The team report back that it was sad to see her go back to her owners after spending time with her, but equally brilliant that she was able to go back as a healthy happy pup! One of the WECare vets went for a home visit recently to check up on her and she is doing really well. 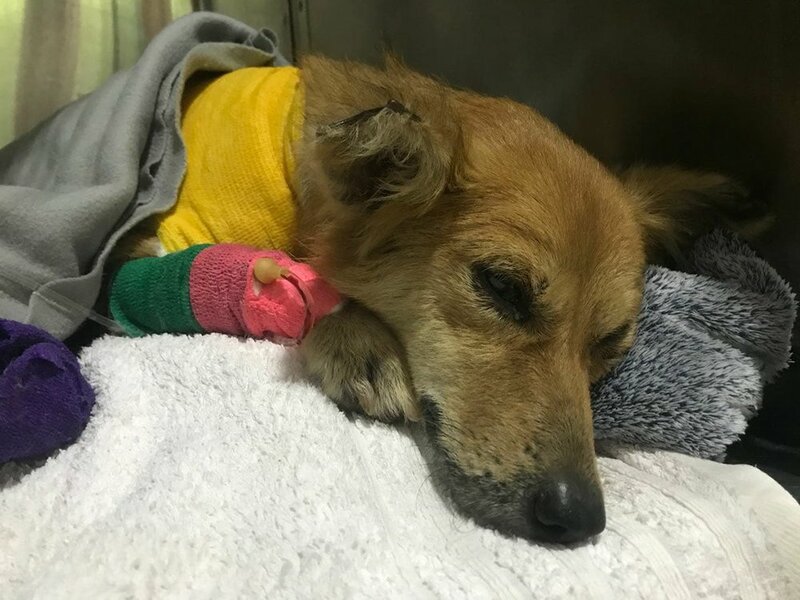 Her only lasting impact (other than having one less leg) is that due to having to have a fair bit of intestine removed, she now does struggle to digest solid food but her fabulous owners have been blending everything and mixing with curd, which she laps up very happily.